There was a time when cruises were mainly reserved for the rich and famous due to their high prices and exclusive status, but these days, with so many different cruise lines operating all over the world, cruises are becoming increasingly affordable and accessible for everyone. So if you’ve never tried a cruise before but have always been tempted to give them a go, this is a great time to take the plunge. March is a good month to take a cruise as the winter has just ended and spring has started, meaning that the busy winter season for cruises has come to a close and the prices are starting to drop a little for spring. This means you can get some really good deals and discounts on cruises in March, with many different routes and adventures available all over the globe from leading cruise lines. Read on to learn all about a few of the best and most popular cruises to take in March, complete with full itineraries and ship details for each cruise. March may be the beginning of spring, but it's still quite a cool and rainy time of year for many places, so a lot of people choose to book cruises down to the Caribbean Islands at this time of year. That's why this '6 Night Eastern Caribbean' cruise from Carnival is by far one of the most popular and most frequently booked March cruises out there right now. Past passengers only have good things to say about this cruise, which makes a total of three stops after setting off from Fort Lauderdale in Florida. For this cruise, you'll have the privilege of traveling on board the amazing Carnival Magic. Truly living up to its name, this cruise ship is magic from top to bottom, with a lot of fun features for passengers of all ages to enjoy. This is a Dream-class cruise ship which first launched back in 2010. It's over a thousand feet long and offers a lot of fun things to do on board including 'The Lanai', which is a scenic, open air promenade you can walk around to admire the views, the Ocean Plaza food and entertainment area, the SportSquare activity and sport zone, and much more. This Caribbean March cruise makes its first stop at Half Moon Cay in the Bahamas. Half Moon Cay is actually a private island exclusively available for cruise passengers, so it's the sort of place where you can rest, relax, and not have to worry about big crowds and lots of noise. Your next stop will take you to Grand Turk Island of the Turks and Caicos islands. There, you'll see even more amazing beaches and warm blue waters waiting to welcome you in. Finally, the third stop of this Caribbean cruise will be Amber Cove in the Dominican Republic, one of the most beloved Caribbean cruise ports of call of all. Another hugely popular cruise to take in March is the '7 Night Caribbean Cuba & Antilles' cruise from MSC Cruises. Offering an amazing exploration of some of the most iconic locations around the Caribbean Sea, this cruise is perfect for all kinds of travelers from history lovers to nature enthusiasts to party-goers and just people who want to sunbathe, snorkel, and enjoy some island life adventures with their friends and families. This cruise takes place on board the iconic and beautiful MSC Armonia. Featuring a Mediterranean influenced design and style, the Armonia is a gorgeous ship to travel on, and it can be fun to simply walk around this ship and marvel at its construction. The Armonia also underwent recent renovations to be better than ever, offering multiple play areas sponsored by big brands like Namco and Lego, lots of fitness and spa services, a huge dance and music area, lots of different restaurants, and much more. This March Caribbean cruise sets off from Miami in Florida and makes its first stop at Ocean Cay, which is actually an MSC-exclusive area, available only for MSC Cruises passengers. So, if you've ever wanted to know how it feels to have your own private island, Ocean Cay is the place to be. Next, you'll head over to Montego Bay for some Jamaican jerk cuisine and a slice of lively island life before visiting George Town on Grand Cayman Islands. Another wonderful area with beautiful beaches and some good shopping opportunities, George Town is the penultimate stop on the trip. Your final stop will be Cuba's capital city of Havana, a city with a lot of stories to tell and landmarks to admire. Looking for a mini March cruise? If so, this '2 Night Bahamas' cruise from Carnival could appeal to you. Available every March, this cruise is one of the top rated options for this time of year. Despite being only two nights long, it really gives you a big taste of Caribbean island life and allows you to fit a lot into a short amount of time. Not only that, it's also one of the cheapest March cruises available, so it's a great option for people traveling on a budget and hoping to keep their costs down. 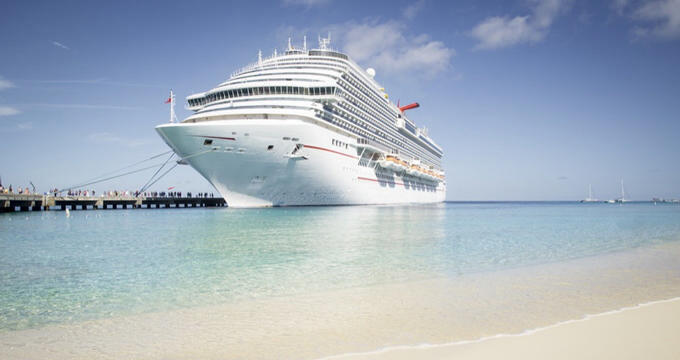 This cruise lets you enjoy a trip on board the Carnival Conquest. Fitted out with all of the classic Carnival features that have helped to make this line such a big name in the cruise business, the Conquest features everything from burger joints to sushi bars, spas, water slides, spa services, fitness machines, live shows, and more. There's something for guests of all ages on board this cruise ship, and the staff are exceptionally friendly too, so it's a wonderful way to travel. The '2 Night Bahamas' cruise sets off from the port of Miami in Florida and makes just a single stop in Nassau. Nassau, the capital city of the Bahamas, is where most of the Bahamas' population lives and works, so it's a very lively location with a lot of shops, restaurants, bars, and more. Whether you're looking to shop, dine, party, relax, or something else altogether, you'll find it here, making this a great way to spend a weekend in March.